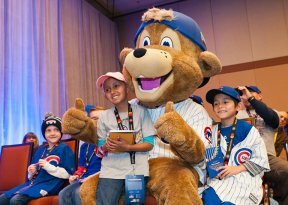 Complete with their press pass in hand, a fresh notepad, and inquisitive nature, patients at Advocate Children’s Hospital came face to face with Chicago Cubs players to ask them some of the toughest questions only a child could ask on Saturday at Cubs Convention Kids Press Conference at the Sheraton Grand Chicago. 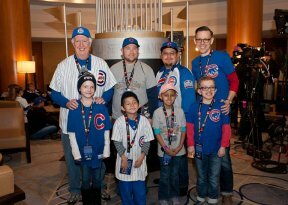 The event served as a way for patients along with their families to have a fun-filled day with their favorite team without having to worry about their illness. 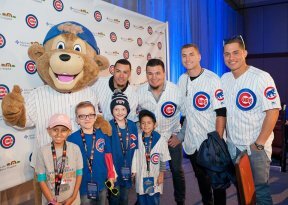 One such young reporter was six year-old Ryne Ward, named after former Cubs infielder Ryne Sandberg, who underwent chemotherapy and radiation after being diagnosed with Wilm’s Tumor and completed his second treatment back in August 2016 months before the Cubs won the World Series. Today, he is disease free. Other young reporters for Advocate Children’s Hospital included Lauren Graver, Mya Tinajero, Carter Sologs, and Tajah Simon. 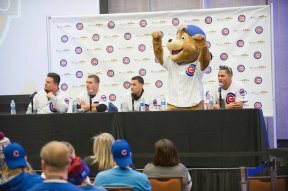 The Cubs Convention Kids Press Conference was presented by Advocate Children’s Hospital in partnership with Chicago Cubs.